The North Sea could still be providing one third of Britain's energy by 2020, but only if there is serious investment made and soon. 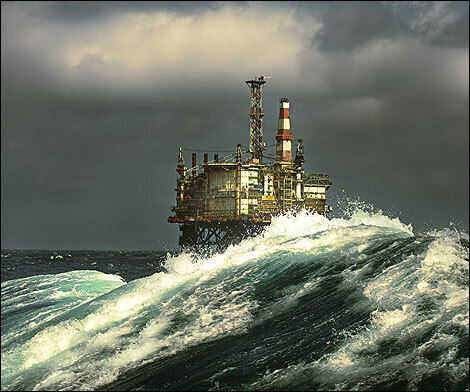 Combined output of North Sea oil and gas has fallen considerably from its heyday at the end of the 1970s to 2.48 million barrels a day last year, a 6% fall from the previous year. It is convenient to account for both oil and gas in terms of the energy equivalent of a barrel of oil, although actual North Sea oil production has fallen from just above 3 million bpd in1979 to just over one million bpd now. It has been warned, however, that without further investment in exploration and development of further fields in the North Sea, production of oil and gas will decline to a mere 0.5 million barrels a day by the end of the decade, which amounts to just 11% of Britain's energy needs. Ofgen chief executive, Alistair Buchanan has said, "For the next two to three years, with gas supplies and power station availability we are in a powerful position. The problem is the speed at which it deteriorates." The lobby group, Oil and Gas UK, thinks that a lack of investment during the past four years has been a main reason for falling gas and oil production levels. 2009 saw a decline in the number of wells drilled by 22% for development and 40% for exploration. Another 11 billion barrels of oil and gas has been reckoned in both new and existing operations, which increases the total offshore reserves for the UK to around 25 billion barrels worth. That said, many of the newly identified deposits are located in the central North Sea or to the west of Scotland, and will require deep-water drilling which is expensive. It is thought that with sufficient investment, UK offshore oil and gas fields could still be producing 1.5 million bpd by 2020, which would meet 35% of the country's total demand for energy. Otherwise, keeping the lights on may prove a challenge since 40% of our electricity is made in gas-fired power stations. Necessarily rising imports of oil for fuel remain a problem in their own right, however, and I predict a steep fall in the number of cars on Britain's roads by 2020 or well before then. I think we shall need all forms of energy. That said it is not a matter of "better". Oil powers the nation's extensive transportation network in the form of liquid fuels and without electric cars/light railways (hydrogen???) to store the energy from wind turbines, your wind farm can't keep people/goods moving. Agreed, in terms of providing electricity for other purposes, there is a strong case to build such offshore installations, although there are problems with putting turbines in such locations, especially in the tempestuous North Sea.